Pillar dominated the view down Ennerdale, jutting out into the valley, and presenting its west face to the lake. It also looms in the view from Wasdale Head, this time dominating the view along Mosedale (although it doesn't actually sit at the head of the valley). Pillar is a long fell, running east-west along the southern side of Ennerdale. The view from further down the valley is actually of the narrower western end of the fell (the fell is three times longer east to west than north to south). Its most dramatic features are the massive cliffs and crags that face Ennerdale for two miles and the impressively steep southern face, which looms over Mosedale. The northern side is my favourite, with a series of impressive coves split by massive crags that loom over the valley below, sometimes emerging threateningly from the fog. Pillar is connected to Scoat Fell in the west and Kirk Fell in the east, with a 400ft drop to Wind Gap and a 1,000ft drop to Black Sail Pass, admittedly over a rather longer distance. There are three main paths onto the summit plateau of Pillar - east from Black Sail Pass, south-west from Wind Gap and north-west over White Pike from Ennerdale. The eastern path can really only be reached from the top of Black Sail Pass, and the north-western ridge via forest paths in Ennerdale. The south-western approach can be reached from three directions, only one of which I have actually used myself. This first approach comes from Scoat Fell via the ridge above Black Crag and is the route we use on our walk. Second is the path up from Windgap Cove in Ennerdale, steep in its upper reaches. Third is the long hard path that comes up from Mosedale, and that is clearly visible from Wasdale Head. I've spoken to someone who has used this path (admittedly with ropes in mid-Winter), but it doesn't look at all appealing! All three meet at Wind Gap and the climb up a rocky but easy south-western ridge. A final route (again one that I've not used) scrambles up from the back of Pillar Rock, allowing someone on the High Level route to reach the summit. I have seen people reach the summit using this route. We have one walk on Pillar, climbing up via Mosedale and returning via Black Sail Pass. Pillar has a large summit plateau, with gentle slopes in most directions but dramatic crags to the north, facing into Ennerdale. The highest point is set back from the edge of the crags, so to find the best views down into Ennerdale move a little way to the north (carefully in fog or mist!). No large streams begin on Pillar. The most impressive beck that belongs entirely to the fell begins around Pillar Rock and flows over some nice waterfalls before reaching the River Liza. The fell is bordered by the River Liza in the north. To the west High Beck emerges from Windgap Cove and flows into the Liza. 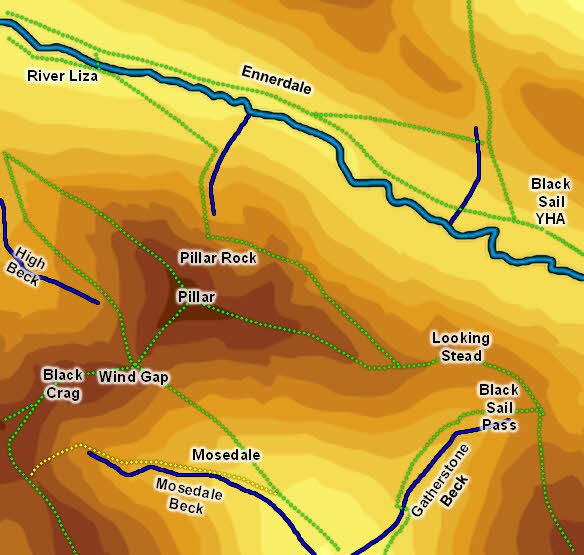 In the east Sail Beck flows north into the Liza, while Gatherstone Beck flows south-west, forming the boundary between Pillar and Kirk Fell. Finally Mosedale Beck flows out of Mosedale, forming the southern boundary of the fell and dividing it from Wasdale Red Pike. There are no tarns on Pillar (although there are some small pools on Looking Stead). The most famous path on Pillar doesn't actually visit the summit. This is the High Level route which runs along a ledge in the northern crags. It leaves the Black Sail path just after Looking Stead, runs past Robinson's Cairn and comes to Pillar Rock. Another path climbs up from Ennerdale into Pillar Cove, completing a circuit. It is possible to scramble to the summit, but (as said above) I've not tried this.